Houghton Mifflin Harcourt, 9780544850194, 256pp. We all know that without water we couldn’t survive, and that sometimes a cup of coffee or a glass of wine feels just as vital. But do we really understand how much we rely on liquids, or the destructive power they hold? Set over the course of a flight from London to San Francisco, Liquid Rules offers readers a fascinating tour of these formless substances, told through the language of molecules, droplets, heartbeats, and ocean waves. Throughout the trip, we encounter fluids within the plane—from a seemingly ordinary cup of tea to a liquid crystal display screen—and without, in the volcanoes of Iceland, the frozen expanse of Greenland, and the marvelous California coastline. We come to see liquids as substances of wonder and fascination, and to understand their potential for death and destruction. Just as in Stuff Matters, Mark Miodownik’s unique brand of scientific storytelling brings liquids and their mysterious properties to life in a captivating new way. MARK MIODOWNIK is professor of materials and society at University College London, where he is also director of the Institute of Making. He is the author of the book Stuff Matters, a New York Times bestseller which won the National Academy of Sciences Communication Award for Books and the Royal Society Winton Prize. Mark writes regularly for the Guardian, hosts regular shows on the BBC, and was chosen as by the Times as one of the one hundred most influential scientists in the UK. 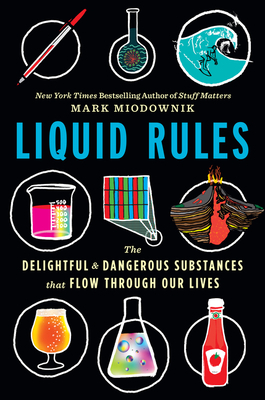 "Written in a conversational tone, with all of the charm that genuine enthusiasm for the subject brings...[Miodownik] draws on his experience as an engineer and materials scientist and his skills as a science writer to make complex concepts accessible and, better still, intuitive...Liquid Rules is both entertaining and informative, which makes it a useful tool in the fight to promote scientific literacy. At a time when technology, science, and public policy are often at odds, Miodownik adds to our understanding of the physical world with humor and sound science." "Miodownik combines history and cutting-edge research to describe the various forms and uses of liquids, from the history of liquid fuels and ink to the art and science behind brewing a great cup of coffee or tea. Liquid Rules is filled with trivia both delightful and gross, because the liquids in our lives can be delightful or gross (or anything in between)...Accessible and entertaining." “Miodownik writes an engaging companionto his previous book, Stuff Matters, painting a picture of our relationship with liquids ('a form of matter in which molecules swim around') via a narrative cleverly structured around a transatlantic flight...Funny as well as instructive . . . This imminently readable book straddles both science and social science and should be enjoyable to readers of high school age through adult."